On Tuesday the 21st June, The Friends of the Montagu Museum and the Board of Trustees held their AGM at the Ou Sendingskerk. I would like to welcome all the new subscribers and look forward to your participation. To all the new Friends committee members, my warmest thanks and appreciation for your commitment. We also welcome Councillor Jacques Kriel onto the Board of Trustees and look forward to his input. After the AGM, we were blessed to have the Department of Cultural Affairs in attendance for the opening of the travelling Medicinal Plant Exhibition. 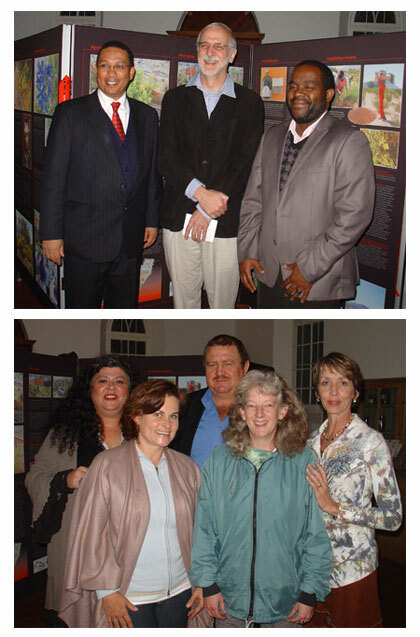 The exhibition was formally opened by the Minister of Cultural Affairs and Sport, Dr Ivan Meyer, who has strong links to Montagu as his aunt Julie Horne (also present) is a Montagu resident and moreover, was baptised in the Ou Sendingkerk. His genuine warmth and appreciation of Montagu did not go unnoticed by those attending the exhibition. Also in attendance: Langeberg Municipal Manager Mr Mokweni, Ms Hannetjie Du Preez (Chief Director: Cultural Affairs, DCAS), Mr Andrew Hall (Director Of Museums and Heritage), Mr Mxolisi Dlamuka (Director Museum Services), Museum Service personnel, museum staff and not forgetting the Friends of the Museum and interested members of the public. Our Curator for Joubert House, Annette Cilliers, did us proud with her enthusiasm and knowledge relating to the uses of medicinal herbs. We were wowed by Beethoven played by a trio of musicians Barbara Ewens, Phil Ewens and Shane Mundell (piano and violin). A memorable evening was had by all. To all those that contributed in making this event such a huge success. Thank you!